With this iExpression you can distribute 3D layers (or other 3D properties) randomly. 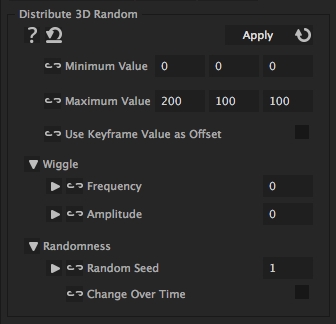 You can still move layers away from their random position using their keyframe values or the wiggle parameters. is the minimum of the possible random values. Note that if you use the wiggle or keyframe offset options, the value could become smaller that this. is the maximum of the possible random values. Note that if you use the wiggle or keyframe offset options, the value could become larger that this. can be modified to get other random values. allows to get a new random value for each frame.